We’ve recently built a Scrypt mining rig consisting of four AMD Radeon R9 290 by XFX for a friend and since this was actually our first rig with Radeon R9 290 cards we’ve had some interesting findings that we decided to share with you, so if you have some of these troubles we might be able to help. Aside from the four XFX video cards we’ve used an EVGA 1300W PSU (you can see the total system power consumption of 1282W from the mains), Intel Celeron G1820 processor and AsRock H81 Pro BTC motherboard, together with 4GB and Windows 7 OS. For the video cards we have used PCI-E x1 to x16 USB 3.0 Extenders with 1 meter long cable and the cards did not have any trouble working like that. Note that the Radeon R9 290 cards are not considered to be the best option for Scrypt mining, however with R9 280X cards harder to find some people decide to go for the more easily found 290 or 290X models. But unlike with Radeon R9 280X, the R9 290/290X cards have more specifics and could cause you some extra headaches until you finally make them work as they should and provide decent hashrate without problems. The average hashrate we got from the cards running at stock frequencies of 947 MHz GPU and 1250 MHz video memory got us about 857 KH/S per card or a total hashrate of about 3.4 MH/S. 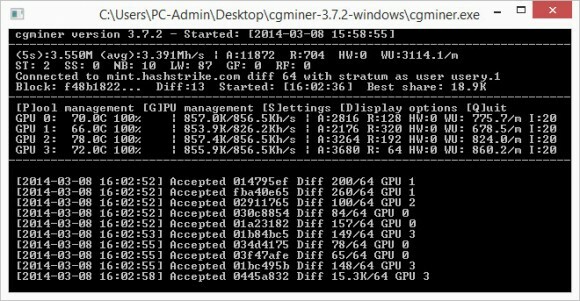 This is what is considered a fairly good results for Radeon R9 290 cards and unfortunately overclocking these cards did not help us in getting higher hashrate, not that we wanted to overclock them as they are already getting quite hot mining Scrypt cryptos. 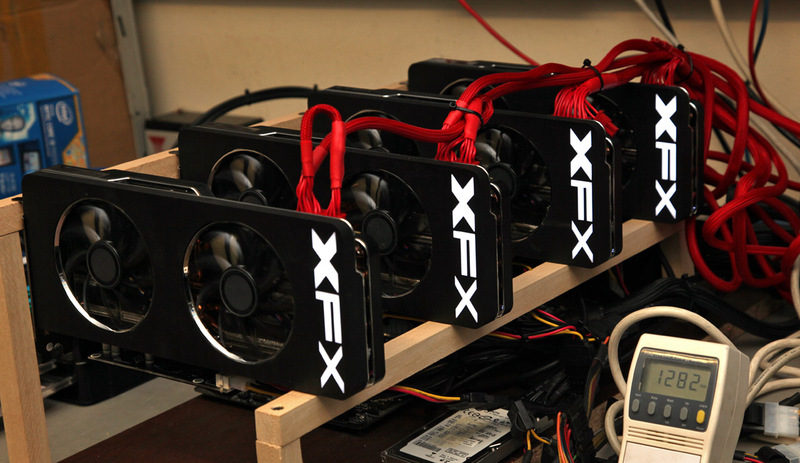 It seems that XFX’s cooling is not that great for mining crypto coins as the temperatures of the VRMs gets easily over 100 degrees Celsius and that is not that great for 24/7 mining even though they are probably rated at up to about 120 degrees C or even a bit more. Note that sometimes even after calling cgminer with the above commands and save a congif file and then you run cgminer.exe directly and it loads up the config file you can still get errors. 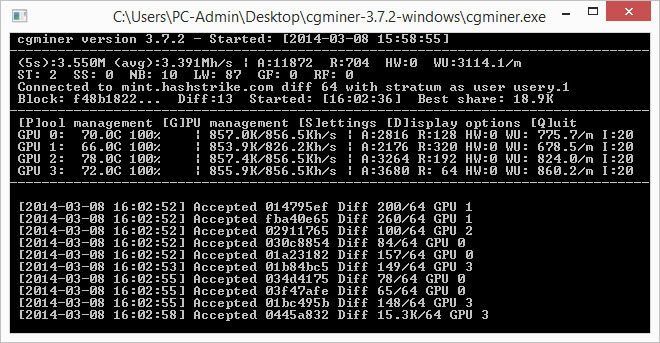 So if you want to use the config file after you start cgminer with the above commands and save them in config just remove all of the parameters from the cgminer.exe start line, but still start the miner with the BAT file! Another very important thing regarding the use of AMD Radeon R9 290 video cards for crypto mining is that these video cards do not feature any analog video outputs, so if you plan on using the mining rig without a monitor connected to a card, then you might have trouble. And you cannot just make a dummy plug with resistors, you will need to get an HDMI to VGA or Display Port to VGA adapter to plug in in one of the available video outputs and then add resistors to the VGA output side. This is the recommend solution that can save you some trouble in making the mining rig function properly or if you want to control it remotely with TeamViewer for example. If you have a digital monitor connected and are going to be controlling and monitoring the mining rig with Radeon R9 290 cards then you don’t need to bother with digital adapters to VGA.